Cayman Sands is an oceanfront villa in Old Man Bay along the north coast. This popular villa is one of only 2-3 homes that offer shore scuba-diving off the famous Cayman Wall. With an open, one-story design, Cayman Sands offers guests an intimate experience across 4,000 sq ft. of living space, plus a one bedroom guest cottage. The main house features 4 bedroom suites (king, queen, 2 twin beds, and 4 bunk beds) with ensuite baths that have been completely re-tiled and renovated. For parties with more than 4 adult guests, the 2 twin beds can be converted to a king upon request. Both oceanfront suites have french doors that open up onto the screened pool atrium and sun deck. 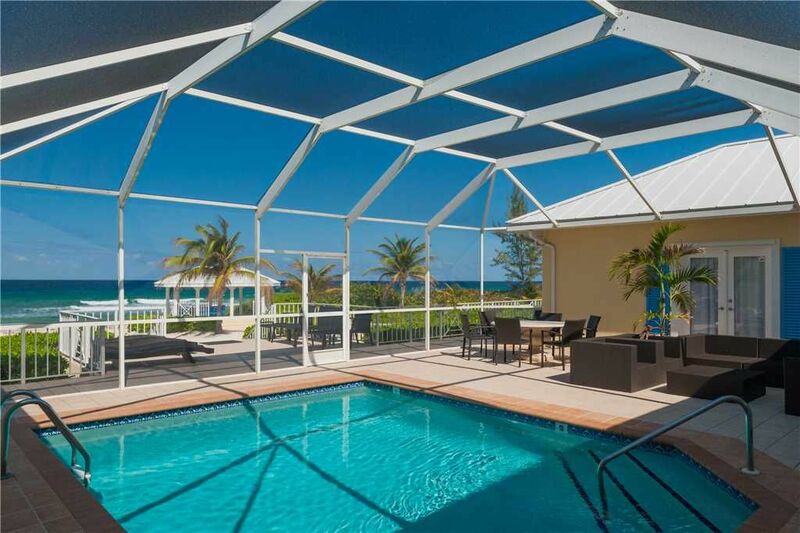 Cayman Sands was thoughtfully designed to be opened up on cool winter nights when A/C isn't necessary. The oceanfront freshwater pool is protected by a screened atrium keeping local wildlife and insects at bay from ruining your stay. Optional pool heat is available in the winter months for an additional surcharge. The pool atrium comes furnished with a sectional sofa and dining table perfect for evening cocktails or outdoor dining. The view of the large sandy beach is framed by the two wings of the house, an oceanfront gazebo, and two hammocks ideal for long afternoons relaxing with a book or simply enjoying the views. An oceanfront vaulted great room floods the villa with natural light and stunning views through 30 feet of sliding glass doors. A recently upgraded kitchen offers all the modern appliances you would expect, as well as dishware, cookware, and cutlery. The living area is furnished with a wall-mounted flat screen TV, plush couches, and a sleeper sofa for small children only. The guest cottage features a queen master suite with kitchenette, screened porch, and a second-story balcony. The guest cottage is NEVER rented separately to unrelated guests during your stay--it is there if you need it. The living area is furnished with a wall-mounted flat screen TV, plush couches, and a sleeper sofa for small children only. A recently upgraded kitchen offers all the modern appliances you would expect, as well as dishware, cookware, and cutlery. 8 seats at the dining table and 4 at the island. The pool atrium comes furnished with a sectional sofa and dining table perfect for evening cocktails or outdoor dining. The view of the large sandy beach is framed by the two wings of the house, an oceanfront gazebo, and two hammocks ideal for long afternoons relaxing with a book or simply enjoying the views. An oceanfront vaulted greatroom floods the villa with natural light and stunning views through 30 feet of sliding glass doors.